The Prince of Asturias will travel this month to Asuncion and Santo Domingo to represent Spain in the acts for the captures of possession of the elect presidents of Paraguay and of Dominican Republic, Fernando Lugo y Leonel Fernandez respectively. The ex-bishop Fernando Lugo will take possession of his cargo next August 15 in Asuncion, the Paraguayan capital, and already 10 chiefs of State have confirmed their assistance at least and up to 76 international delegations. 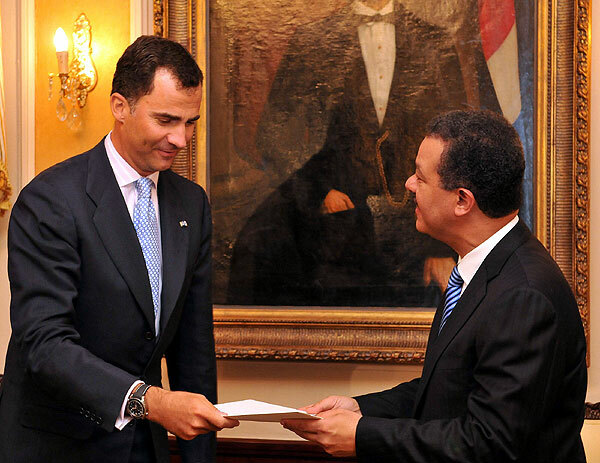 One day later, on August 16, Don Felipe will move to Santo Domingo to be present at the acts on the occasion of the capture of possession of the Dominican president, Leonel Fernandez, which obtained the re-election in the elections of last May. Prince Felipe will meet next Thursday in Asuncion the Paraguayan president, Nicanor Duarte, and the ex-bishop Fernando Lugo, that the following day will assume the headquarters of the State, they informed today official sources. In agreement with the official program, the inheritor of the Wreath of Spain will come to the Paraguayan capital on Thursday morning to be present at the capture of possession of the elect Paraguayan president. In the early afternoon, the Prince will support a hearing with the next president of Paraguay, in the official residence of the chief of Mburuvichá Roga's State, and later he will meet Duarte, in his Asunción's particular residence. On Thursday morning, the Prince of Asturias will receive in hearing representatives of the Spanish collectivity in Paraguay, in the residence of the ambassador of Spain, and later he will have lunch in the same place with personalities of the political, economic , culture and socially of the country. His first day of stay in Asuncion will be closed with the dinner offered by the salient president to the personalities that will be present at the acts of the transfer of being able, in the Palace of Government. On Friday, the official delegations will be present at the act of oath of the president Lugo in a theater box raised next to the Congress, in the center of the capital, and the tedéum that will be informed in the nearby Cathedral. Before the midday there will be realized the official greeting of the elect president to the foreign delegations in the Palace of Government. The Prince of Asturias will not take part in the lunch offered by Lugo, because he has foreseen to travel to Santo Domingo, where he will be present on the 16th at the capture of possession of Leonel Fernandez Reyna for his second mandate. In a plane of the air Spanish force, the prince of Asturias, Felipe de Borbón, arrived to Asuncion to be present at the act of Fernando Lugo's oath. There did not come the princess Letizia. This evening it will be got by the ex-bishop. The prince of Asturias was got by the national chancellor Rubén Ramirez Lezcano and the Spanish ambassador in Paraguay, Miguel Ángel Cortizo. I am really impressed that Spain has several women in the upper eschelon of government. he is a very elegant man!!!!!!!!!!!!!!!!!!!!!!!!!! Prince Felipe was last night in the state banquet offered by president Fernández at the National Palace. He travelled by himself, I mean without CP Letizia. Oh My! I have always thought Felipe is a striking, elegant & sensual man!